If you're involved in training people to do things under Windows, whether it's using common applications, browsing the Web or changing Windows' settings, one of the most effective ways of teaching is using a video to run through the actual mouse movements you make and the keys you type to achieve the result. 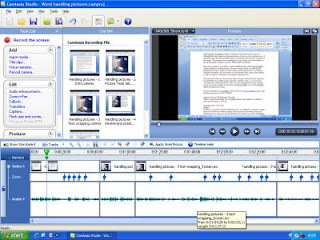 Camtasia Studio 6 records all this, with an audio track so you can include a narration or comments. It enables you to assemble a video from a number of clips, too, which is essential if you're not completely fluent in front of the ‘camera'. Clips can be positioned on a timeline or storyboard, reordered and edited by trimming sections out of them. Editing operations are not as intuitive as they could be, though. For example, a common requirement is to trim off the start or end of a clip. How easy this would be if you could stop playback and delete from the cursor position to the start or end of the current clip with a keyboard shortcut. Instead, you have to create a marker at the cursor position and another at the start or end of the clip and then click the scissors icon (the Delete key doesn't work for cutting). thak U !!! it works ! !